Babies seem to have their own plan and routine in mind when it comes to bedtime. Scrapbooking your baby and the way she likes to "do bedtime" will be a page that you will love to remember as she grows. This page could focus on favorite stories, songs, and other things your baby enjoys when it is time to go to sleep. Displaying your baby with a photo of mommy or daddy rocking her would be a sweet addition along with a picture of snoozing in her crib. 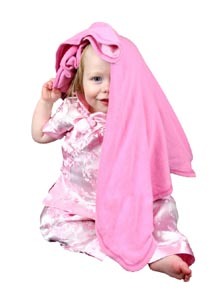 Does your baby have a favorite blanket that she must take to bed with her? What did she call her beloved blankey? Use alphabet stencils or use your computer's font as templates to post the name of your daughter's blanket. Consider leaving space for a vellum scrapbook envelope where you can put a small swatch of the blanket after she finally gives it up! Find a great selection of paper and accessories to make the perfect Bedtime Routine page for baby's scrapbook! Have You Created a Bedtime Routine Scrapbook Page? Share your Bedtime Routine Scrapbook Page with all of us!